The Cessna 172 Skyhawk is the most successful mass-produced light aircraft in the history of aviation. Ever since the very first model rolled off the assembly line in 1956, Skyhawks have been in constant service worldwide, with the design and avionics constantly updated. Each aircraft can seat a pilot and three passengers. 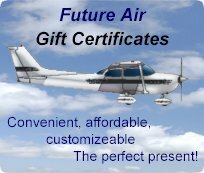 At Future Air, we use our Cessna 172 airplanes for Flight Training, Sightseeing and Aircraft Rentals.